THE CLFMI LES GRUBE MEMORIAL DESIGN AWARD IS NAMED FOR ONE OF CLFMI’s PAST PRESIDENTS AND A TRUE LEGEND IN THE FENCE INDUSTRY. 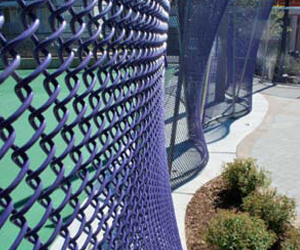 The Award was created to highlight the versatility and functionality of chain link fencing products. 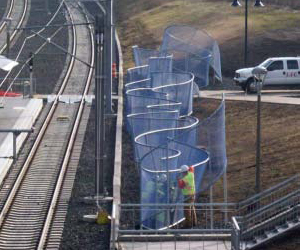 CLFMI recognizes the designing architect and installing contractor of the project that is deemed to represent the most unique and practical way of incorporating chain link fencing materials. The architect and contractor each received a specially-designed plaque and a cash award. The program is jointly funded by the CLFMI and the Les Grube family. The Award was established in 1984 during Les Grube’s term as CLFMI President. 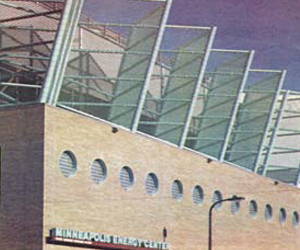 Les was instrumental in outlining the award’s qualifications and establishing connections with the architectural community to support the concept. The first award went to Pritzker Award-winning architect Frank Gehry for his design of the Sign at Santa Monica Place. 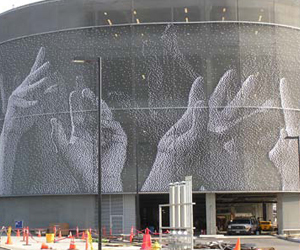 Over the years, the award has been given to projects as diverse as the “living” façade of an airport facility to the design of a “slam dancing” nightclub in Tijuana. 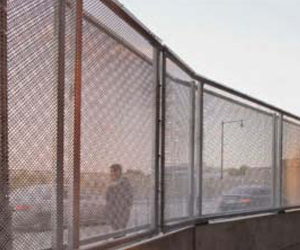 The Chain Link Fence Manufacturers Institute (CLFMI) has announced that it is now accepting applications for its 2018-2019 Les Grube Memorial Design Award contest. 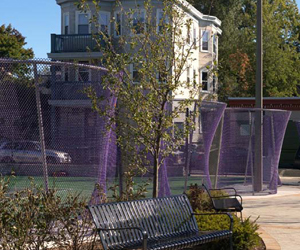 The Award includes a uniquely-designed plaque and cash awards of $2,500 to the designing architect and $1,000 to the installing contractor and is given for the project which makes the best and most unique use of chain link fence materials. The 2016 Award was presented to David Dowell, AIA (el dorado architects) for his design of the Main Street Redux Project (see attached description) and to Collins and Herman, Inc. (contractors) for their installation of the project. Previous winners of the award include Pritzker award-winner Frank Gehry, Venice, CA; Arai/Jackson Architects, Seattle, WA; and Don M. Hisaka and Associates, Cambridge, MA. Architects and contractors are encouraged to submit applications as soon as possible to be considered for the 2018-2019 Award. APPLICATION FORM FOR THE 2018 LES GRUBE DESIGN AWARD PROGRAM. 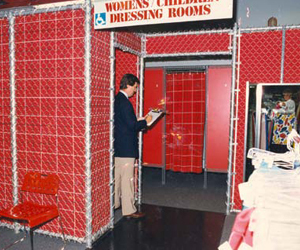 Employ an innovative use of chain link fence materials (fabric, framework, and/or gates) on a commercial or industrial project. Be conceived by a professional architectural or engineering firm. Be installed by a professional fence contractor. Fill up the online application form or download the pdf copy below. 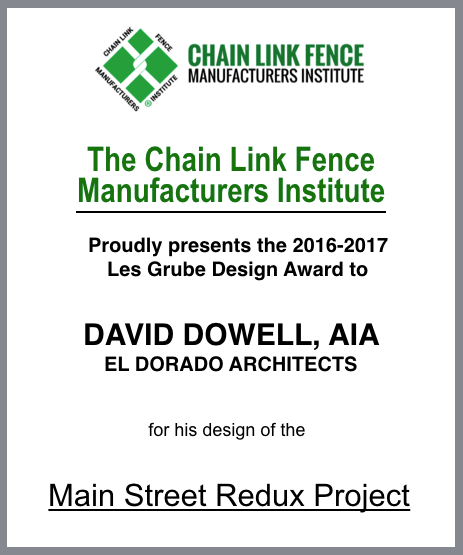 The Chain Link Fence Manufacturers Institute (CLFMI) has announced that the 2016-2017 Les Grube Memorial Design Award has been given to architect David Dowell, AIA and installer Collins and Hermann, Inc. for their work on the Main Street Redux Project in Kansas City, MO. The introduction of a streetcar line along Main Street triggered reconsideration of the Main Street bridge over I-670. 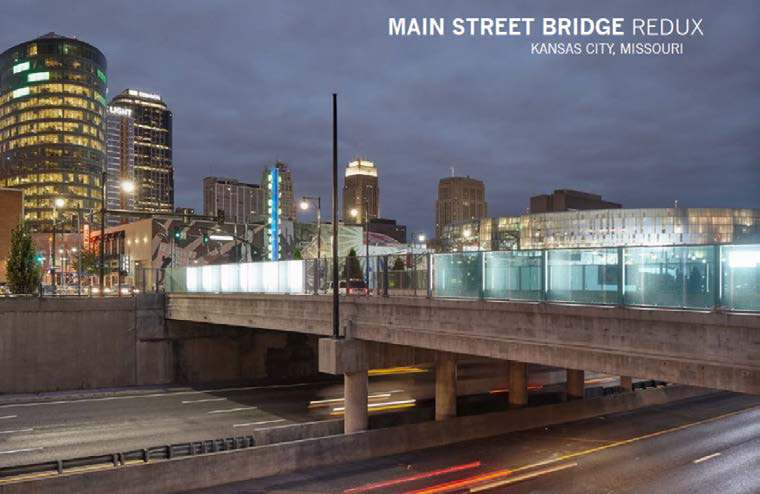 The existing Main Street Bridge was an integral piece of Pedestrian Strands, a public art commission by an architect and artist, and this team was folded into the design team for the new bridge. 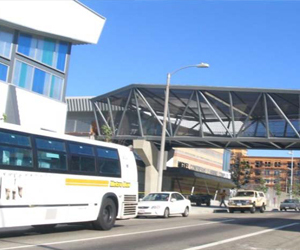 Pragmatically the project adds acoustical buffering from highway traffic below, provides improved pedestrian circulation and ADA accessibility. 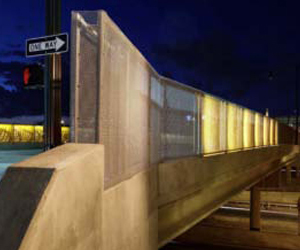 Artistically, the new work continues the work of Pedestrian Strands in creating a three-dimensional, lateral composition that folds the immediate experience of the bridge into the broader environment created, in part, by the I-670 highway cut. The CLFMI Design Award is named for Les Grube, a Past President of the Chain Link Fence Manufacturers Institute and a fence industry pioneer. The winning architect and contractor each receive specially – designed plaques and cash awards of $2,500.00 for the designing architect and $1,000.00 for the installing contractor. 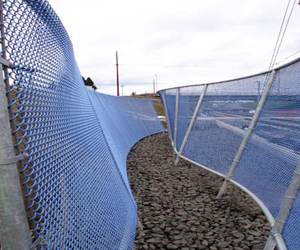 The Chain Link Fence Manufacturers Institute (CLFMI) has announced that the 2015 Les Grube Memorial Design Award has been given to architect Bruce Dees and Associates, Tacoma, Washington and the Sea West Construction Company, Seattle, for their work on the Browns Point Athletic Fields Project in Tacoma. Brown Point Park Fields in Tacoma, Washington, are elementary school playfields during the school day and community park fields after school and on weekends. 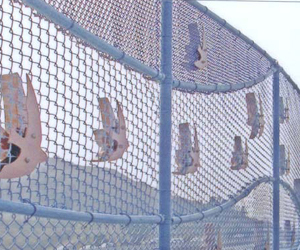 The unique character of the chain link baseball backstops and soccer backstops punctuate the otherwise flat, open fields. 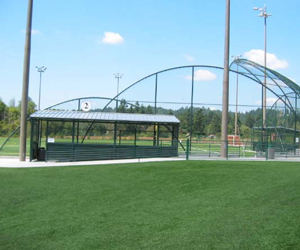 The 15° slope of the baseball backstops toward the field redirects foul balls rolling up the back wall of the field. Without the slope, balls would roll up and over the backstop wall and onto the walkway behind the field. The same 15° angle is then carried along each wing of the backstop, stepping down in a rhythm that accentuates the entire structure and giving it a unique and attractive character. Treated 2×12 plank backboards provide a vital function and visual foundation that complement and finish the structure. 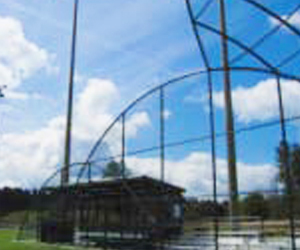 The backstop posts also support the dugout roof with a continuous longitudinal slope. The matched pairs of complementary, functional features are really art forms, providing the vital function of safety and aesthetics for all park users and visitors. The framework consists of Schedule 40, 4.0” OD posts with 1.66” OD rails. The 9 gauge fabric is secured to posts and rails at 6” on center behind home plate and 12” on center elsewhere. 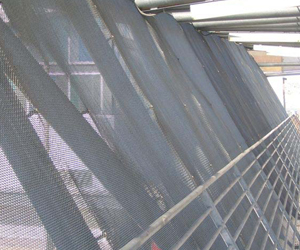 As a construction material, chain link fabric and steel framework provide the flexibility to create the unique form while providing a strong, durable, overall diaphragm. 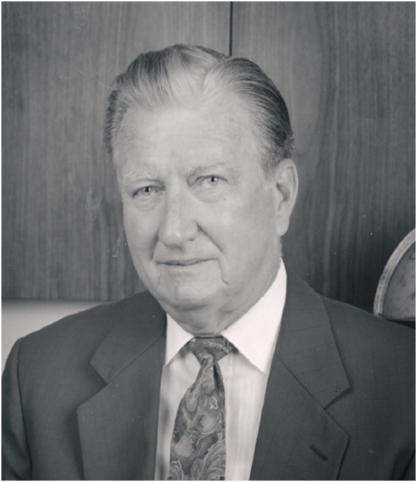 The CLFMI Design Award is named for Les Grube, a Past President of the Chain Link Fence Manufacturers Institute and a fence industry pioneer. The winning architect and contractor each receive specially-designed plaques and cash awards of $2,500.00 for the designing architect and $1,000.00 for the installing contractor. 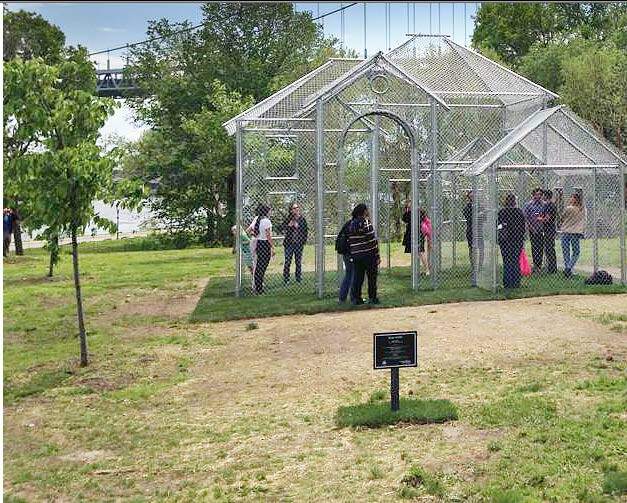 The Chain Link Fence Manufacturers Institute (CLFMI) has announced that the 2014 Les Grube Memorial Design Award has been given to architect Michele Cetera, AIA and the 458 Construction and Fence Company for their work on the Ghost House Project at Randall’s Island, NY. The Ghost House is a public sculpture commissioned for Randall’s Island Park by the New York City Department of Parks in partnership with the Bronx Museum of the Arts. The concept for Ghost House originates with artist Wilfred Smith’s Fences Furniture sculptures, a series of furniture constructed entirely of chain link fence. Ghost House expands this concept to delineate the entire home, inspired by the many baseball backstops in Randall’s Island Park. This sculpture uses the material to create a delicate three-dimensional “drawing” of a house executed in woven steel wire and pipe. Ghost House has a footprint of 18 by 24 feet, and stands 16 feet in height. 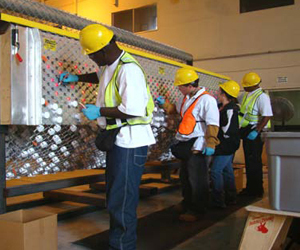 Industry guidelines were followed in the design and detailing of the structure, using standard chain link fence fabric, pipe, and fittings. All chain link products were generously donated and delivered on site to the project by Eastern Wholesale Fence Co., Inc. of Medford, NY. www.easternfence.com. Park visitors are invited to use Ghost House for ball games, play, contemplation, or even live performance. The title for Ghost House pays homage to architect Philip Johnson’s structure of the same name in New Canaan, CT.